Disclosure: I was provided a free camper registration in exchange for my review. All thoughts and opinions are my own. Rebekah had a busy week last week. She was so excited to get to particiapte in the Challenger Sports - British Soccer Camp. What a whirlwind week it was. Challenger brings in soccer coaches from England (we had two from London and one from Yorkshire) to coach the kids. Rebekah said she learned a lot about better dribbling and ball control/footwork. I noticed that having a different 'coach' gives her a different perspective and that these coaches focused on some different skills than her season coach. To keep the kids motivated and having fun, they are put on a "World Cup Team" for the week. Rebekah was on the Cuban team (Go Cuba!) Different activities and homework gave the team points and at the end of camp, one team was awarded the World Cup Trophy. Last week, at our camp, France won. Congratulations to the French team from camp. Monday they received their soccer balls (included with the cost of camp) and were told to decorate and bring every day. Tuesday, Rebekah won for the most decorated ball. Wednesday was "Wacky Wednesday" and they dressed crazy. For Thursday, they learned 3-4 fun facts about their country. PLUS - Friday is Fun Day Friday so they did lots of games during camp which culminated in a big water fight. Here's my video of the water fight - I crack up everytime I watch it. Listen to Coach Katie scream as someone hits her with ICY cold water. 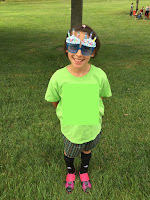 I had a child excited to go to soccer camp (when she's not always keen to go to soccer practice). I had a child with a soccer ball between her feet and who started practicing moves again each night. She is still doing drills almost every day. She had fun, got exercise and brushed up on her skills before fall ball starts. She even learned some fun information about other countries and got to ask coaches from England about their home country. Did I mention how much fun she had? I wasn't sure if going through the Challenger Sports - British Soccer Camp was something that we would find valuable. It was so much more than just a skills camp. There was a lot of teamwork taught, integrity on and off the field reinforced, and they had fun while learning the skills. It is something she thoroughly enjoyed and looks forward to doing again next year. Notes from the coaches at the end of one of the days of camp. There are still camps available both in Omaha and around the country. Even some rual Nebraska towns will have camps in August. For more information and to register, please visit the Challenger Sports website. In various areas around the country, they also have fall and spring ball.